Neil the Horse was a funny animal comic strip written and illustrated by Katherine Collins, starting in the late 1970′s. Throughout the 1980′s it was one of the most popular funny anthropomorphic comic books going, adored by classic funny animal fans and underground comic aficionados alike. Equally a tribute to old fashioned comic books, classic Hollywood musicals, and children’s books, Neil and his friends largely disappeared after the 1990′s. 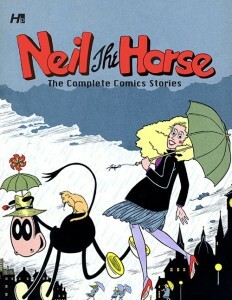 Now Hermes Press have announced that the dancing equine’s comic book adventures will finally be re-released in Neil the Horse: The Complete Comics Stories. Collecting Neil issues 1 – 15 and featuring a historical essay by Trina Robbins (a comic book legend in her own right), this hardcover collection will ship this coming December — but Amazon is taking orders now. So I don't know if you know this, but Hermes Press is doing an Indiegogo campaign to raise funds to print Neil. It's at http://igg.me/at/neilthehorse/x/4659624. I hope they can do it with $2000 rather than $15,000 . . .